Darth says "bypass hand controller? " The PMC8 has none and is run from a tablet or? Is he referring to the EXOS 2GT ??? Ahh yes, I actually already have a powered 20 foot usb extension. But I didn’t have the RJ9 to RJ45 cable yet. I’m just going to make one. Maybe a new version? Notice the different drive motor covers and the Meade hand controller. Clearly, it looks like Meade Autostar for the GoTo system on an EXOS-2GT... I don't know anything about the Meade Autostar but it could be a step up. Personally, I think my next step upward will either be an EXOS-2GT PMC-Eight or a Losmandy G-11. I'm not ready for the jump yet but I am leaning toward the Losmandy for the much higher capacity. I'm working on a smaller package right now so I'm playing with and tinkering with the new iEXOS-100 in my living room. We typically won't see sky here until Spring so... I'm stuck indoors, learning and playing. I'm going to have to research that Meade Autostar system now. I once had an interest in a Meade ETX package but I was turned off by all the plastic. I know virtually nothing about the Autostar system though. Does any know off hand what size the allen head bolts are for the RA adjustment. I need to adjust for backlash but I can't seem to find the right size with either of my SAE and Metric allen wrench sets. I got this mount second hand and am having some issues with guiding via the st4. PHD2 does make corrections and adjustments but the backlash is intense and is causing thin lines to protrude from the stars, creating an almost saturn look to them. My questions are what types of suggested maintenance, upgrades and service is needed to bring this mount up to the required levels? Are there any guides or videos to show disassembly and maintenance? To those that use PHD2 guiding what settings are you finding to work the best? Edited by Strandon, 11 February 2019 - 11:03 PM. It is also possible to turn off the backlash compensation and to guide only in one direction in DEC axis (north or south) once you have detected the drift direction due to polar alignment offset. I'd be very interested in reading about this through your link, mwr, however your link only reopens this current page. I would also be interested in following that information in your link, but for some reason it does just redirect back to this topic on Cloudy Nights. Would you mind sharing it again? I have had to adjust the RA worm gear twice already, and its really not that hard to do. There is definitely a brake-in period with this mount. I would also like some more info on "hyper-tuning" and what all is involved with that. Here is the link where I purchased the DVD on Hypertuning. The DVD was geared specifically to the LXD 55 which is why the previous link was helpful because it is the LXD75 which seemed almost identical to the EXOS 2. What DVD/video are you watching to hyper tune this mount? Thank you! Do you suggest changing the bearings to the PTFE ones? No. I didn't really do anything with the bearings. The nice thing about the EXOS 2 is that it already has the roller bearings not the worm gears and the main shafts. The bearings on the main shafts are pressed in and i didn't do anything with these. I basically cleaned out the old grease, and polished up some of the main contact surfaces and re-greased. I'm still not sure how much it improved the performance of the mount, but will let you know when I have a chance to do some photography. Probably the best thing to do is to keep the worm gears adjusted to reduce backlash, and keep clean grease in there. Also the Allen head screws were some weird size on mine. I had to grind down a 4.5mm Allen wrench to fit. 4mm was too small and SAE sizes didn't fit either. I ran the linked PDF file through google translate and got the following, this is pretty funny. Perhaps you can determine what they mean by "snail" and "game"
Find out which of the parts of the telescope are responsible for the game. Possibility to listen carefully without noise. Step 4) Mount the engine again. Step 5) Test Position using the arrow keys. Did the engine noise change? the noise is even, the game setting is finished, otherwise back to step 1. Materials expand differently, which can lead to a change in distance. Optimized game, and out in the cold, the engines no longer rotate. between the gears, see also figure "Drive with gears 1"
Make sure that the screw presses on the milled surface of the axle. In the following we want to eliminate the existing residual play. 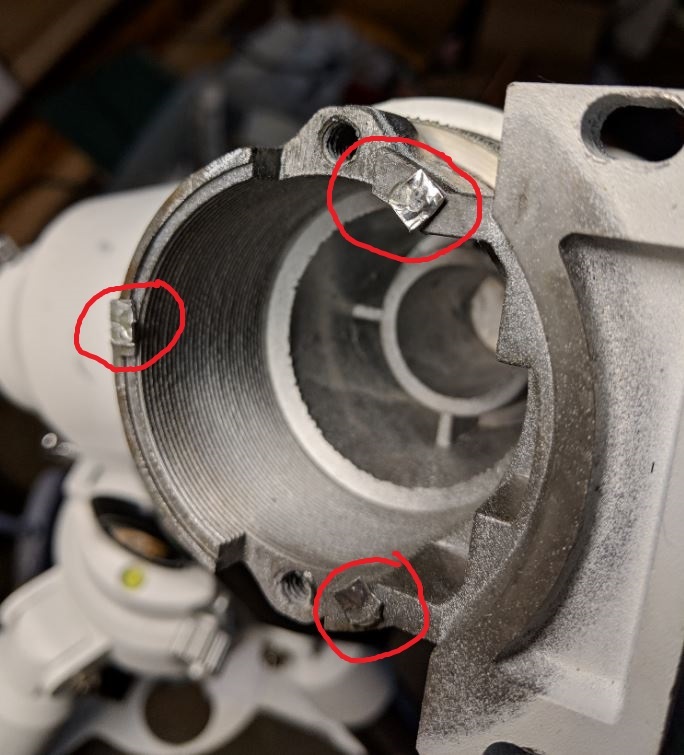 entire electronics removed, see figure "Autostar with Motors 1"
set or connect, see illustration "Declination screw unit 1"
Screws 1 and 2 provide the firm connection of screw unit and declination housing. Screw 6 connects gear and worm. remove, see illustration "Declination screw unit 2"
following the procedure of minimizing the game on the D ec axis shown. Loosen the counter nut 1 from the figure "Declination screw unit 2"
the adjustment with the lock nut. Function test: Reassemble the motors, ensure that the drive gears are correctly spaced. to go back to the setting procedure. Loosen the screws 1,2,3 and 4 in the picture "Declination screw unit 1"
Check the game and the game. I was working on the same thing before I got called away from the computer. Thank you Jerry! I am going to say game=play and snail=slow. Just a guess though. Edited by Strandon, 12 February 2019 - 04:15 PM. Edited by Gustoresto, 14 February 2019 - 08:15 AM. I noticed when manually moving the mount via the hand controller that the motors sped up when I released the button. Such as when using a 16x speed to adjust the RA with the arrows I will run it to the point I want, let off the button, then the RA will move a bit further at about 150% the speed I had it set at. Is this normal for this mount, if not what is the cause for this? When U let off the arrow buttons the mt should stop right there except maybe on the higher speeds where it takes an instant to stop which is why U use #3-5 speeds to center yer align stars or other objects. Then U won't overshoot. In any case the speed shouldn't change like that which indicates a handset giving the motor bad instruction. The firmware w the EXOS 2 has other reports of runaway slews etc. A LOT of this type of misbehavior has been fixed by doing a "reset" in the settings menu which dumps old data giving bad orders. To anyone that has taken this mount apart can you tell me if these shims are from the factory, or user modified? This mount was used and while taking it apart I noticed these. Those are the same shims I have in my mount that was purchased new. They are from the factory.